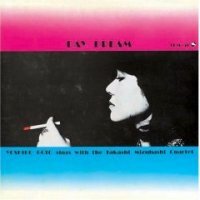 When this album was recorded in 1975, Yoshiko Goto had been singing for 20 years. As is always the case, she could have made more money singing pops, but she would rather not sing at all if she was not singing jazz. In this, another memorable vocal album from Three Blind Mice, Goto is paired wih a quartet led by bassist Takashi Mizuhashi, with young pianist Junichiro Ohashi (this was his recording debut) and alto saxophonist Yoshio Otomo providing romantic solos and counterpoints. Goto sings a selection of mostly slow-tempo ballads honestly and effectively, with subtle shadings and inflections that can be acquired only through long years of life and musical experience. The first four songs (which were pressed on "Side A" on the LP) are about the joy and happiness of being in love, while the last four ("Side B") talk about the pain and suffering assosiated with love. Produced by Takeshi Fujii. Recorded on February 17 and 18, 1975. Blu-spec CD is compatible with all regular CD players. Paper sleeve special limited edition.